A little girl with Down’s Syndrome watched Moana every single day when she was battling pneumonia in hospital. If you haven’t seen the film, take it from me, it’s an animation with the capacity to brighten up the darkest of days. That’s what it did for Rosie Kneen, according to her dad, Jason. So, her proud dad made a request on his daughter’s behalf, and messaged Dwayne ‘The Rock’ Johnson, who voices one of the central characters, to ask him to send a little message to the brave youngster. Jason shared an adorable picture of Rosie playing with a caption explaining how the film helped the pair deal with the hardships of child illness. Rosie I and became thick as thieves over that time and watched Moana together many times and EVERY SINGLE DAY. Thanks @TheRock for teaching me all the songs. Rosie was so brave, and so strong. 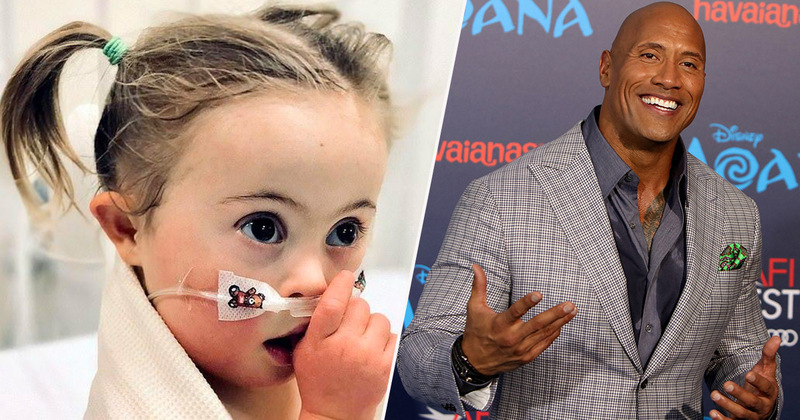 Jason also shared a photo of Rosie in hospital with a breathing tube, watching the film, which prompted a reply from the Hollywood actor, who voices the character Maui. Look at this lovely cookie. Stay strong Rosie! Uncle Maui loves ya. What can I saaaaayy except you’re welcome. The kind message was – in case you somehow missed the song of the century – a reference to You’re Welcome, the tune Maui sings at the start of his journey to redemption when he meets Moana for the first time. Meanwhile, Jason has been using Twitter as a platform to share some supportive words with other parents of children born with Down’s Syndrome. I was totally NOT ready for a child like Rosie. It was a shock when she was born and I’m ashamed to say I didn’t take it well initially. Part of that was the matter-of-fact process that happens where you’re bombarded with documentation and booklets and basically “manuals” on “what’s wrong and going to go wrong with your child”. It’s devastating to hear how your child’s life has already been predicted and mapped out. All children are different — how can ANYONE predict their future? Quickly I realised that ANY child can be slow to talk; slow to walk; have learning difficulties, and ANY child can be brilliant and wonderful and amazing. Jason concluded by sharing some pictures of Rosie in hospital going for treatment, and now, fully recovered and enjoying school – and the after school viewings of Moana, of course.